WELCOME TO MAI'S VIETNAMESE RESTAURANT! 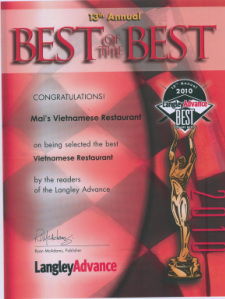 Mai’s Vietnamese Restaurant opened in January of 2009 in the developing Walnut Grove area of Langley, British Columbia (only 25 minutes away from Vancouver). The restaurant was founded by Loc Huynh, who had immigrated from Vietnam almost three decades ago. Loc combined her passion for Vietnamese cuisine, high standards of excellence and decades of restaurant and management experience to produce a new benchmark for Vietnamese restaurants. Mai’s Vietnamese Restaurant offers high-quality, great value, authentic Vietnamese cuisine served with excellence in a clean and modern facility. Come join us to experience an emulsion of flavors using fresh traditional ingredients that will inspire your taste buds to come back for more!